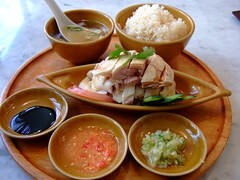 Hainan Chicken Rice, Y850. Extra chicken, Y200. Second time I tried it was not as good as the first time. 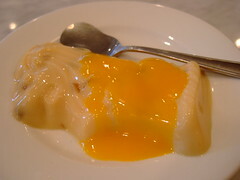 Hainan Chicken Rice – Deep Fried Chicken, Y850. The fried version is this restaurant’s original menu and I actually like it better than the standard steamed one. 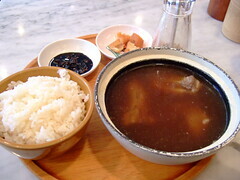 It’s free to ask for more rice and soup. 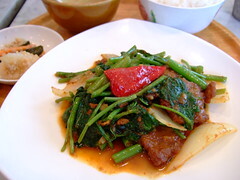 Beef and Kuushinsai stir-fried with Sambal, Y950. 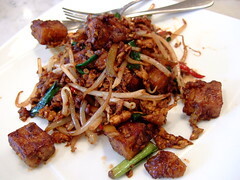 Fried chicken in Special Chilli sauce, Y950. 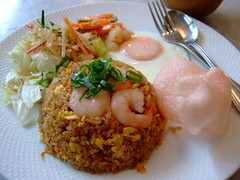 Malaysian Nasi Goreng Plate, Y950. Free to ask for large porton for this one. 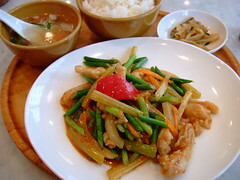 Chicken and garlic sprout in yellow beans chilli sauce, Y950. 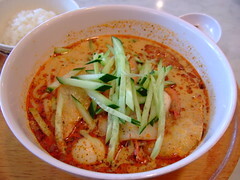 Laksa Noodles, Y850. 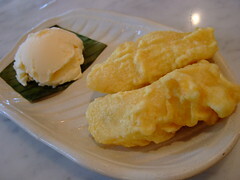 Yam Ice-cream, Y380. 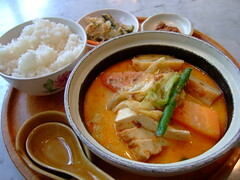 Singaporean chicken curry rice, Y850. 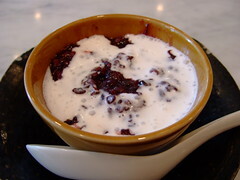 Bubur Pulut Hitam(Black glutinous rice porridge cooked with sago and served hot with coconut milk), Y380. 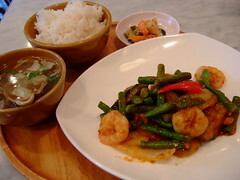 Long beans and prawn and eggplant stir-fried with Sambal, Y950. 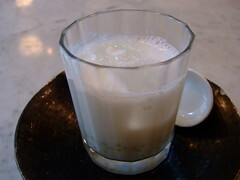 Bubur Cha-cha(Yam and sweet potato cubes served in coconut milk and sago, served cold), Y480. 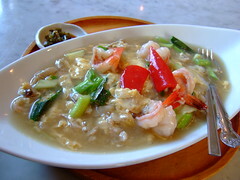 Laksa Prawn Beancurd(fried prawn stuffed beancurd), Y850. 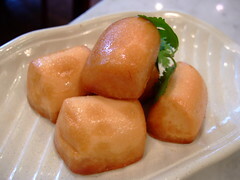 Singapore Style Carrot Cake(Black), Y830. 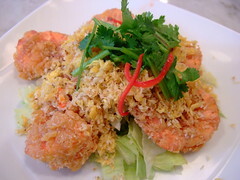 Butter Prawn(Fried prawn with butter, coconut and lemon grass), Y1580. 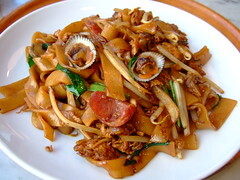 Seafood soy sauce fried noodles, Y850. 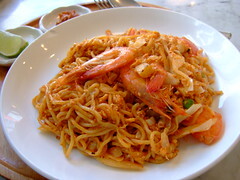 Singapore Curry Noodles, Y850. 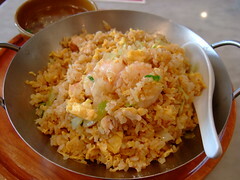 Laksa Fried Rice, Y950. 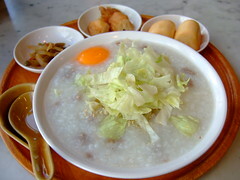 Beef and lettuce porridge, Y750. 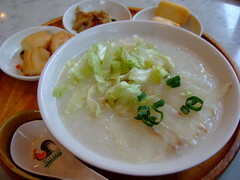 Fish porridge, Y750. 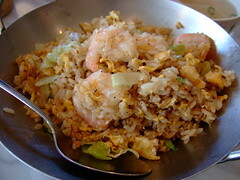 Black Pepper Fried Rice, Y950. 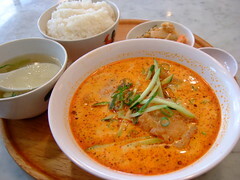 Most of the above are cheap lunch sets available from Mon to Sat, but some are from holiday lunch menu. 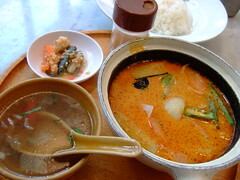 I think the food is nice in general – there were days when the food wasn’t that great but it’s cheap and the staff are friendly. 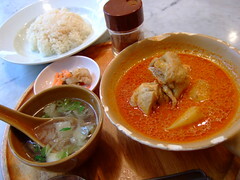 My favourites from the weekday menu are: Hainan Chicken Rice(deep fried version), Fried chicken in Special Chilli sauce, Lontong, Fried Hokkian Mee, Singapore Curry Noodles, Laksa Prawn Beancurd. 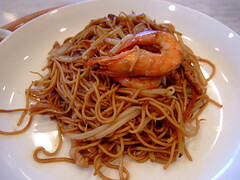 Favourites from the holiday lunch menu are: Seafood soy sauce fried noodles, Laksa Fried Rice, Char Kway Teow, Singapore Mee Goreng, Black Pepper Fried Rice. 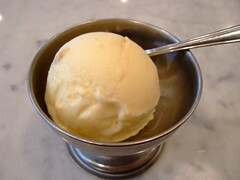 For dessert, Durian Ice-cream is the best. 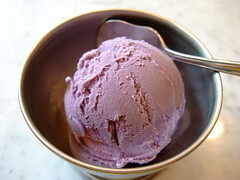 Yam ice-cream is good too. Menu: 1, 2, 3, 4, 5, 6, 7, 8, 9, 10, 11, 12, 13, 14, 15, 16, 17, 18, 19. 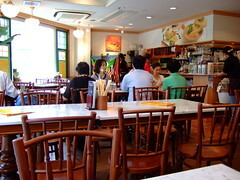 This entry was posted in 13:水道橋・後楽園, Good Cheap Eats by seat. Bookmark the permalink. So nice to see new postings from you, keep up the good effort! 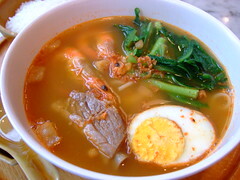 This is the food blog i always look forward for updates, the photos are gourgeous 🙂 ! Thanks! I’ve been caught up with work work work and have very little time for updates. I’ll try harder! Hi! 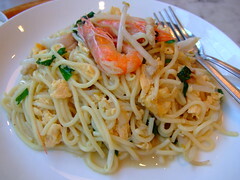 Nice food blog! 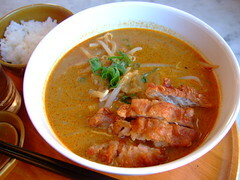 It’s rare to see Singaporean food done decently in Japan. Is the owner of this place a Japanese or Singaporean? Thanks! I have no idea where the owner comes from but the staff all speak Mandarin(I think it’s Mandarin…) so maybe they are Singaporean Chinese. 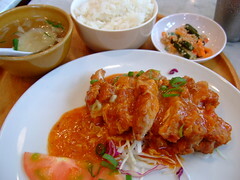 Wow there’s Hainan chicken in Tokyo!